There's no shame in frequenting a delicious sit-down chain -- unless opening wide enough for the Awesome Blossom causes your fake glasses/'stache to fall off, in which case, there's a lot of it. 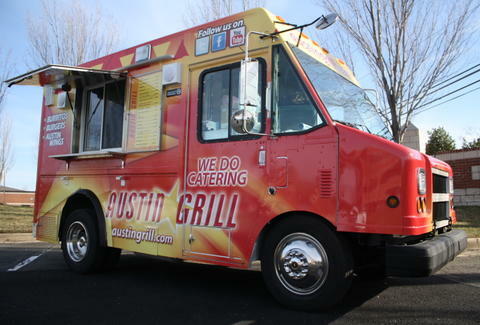 For Austin Grill grub without the risks of being caught there, check out The Austin Grill Food truck. Burgers and Sandwiches: Their original burger's topped with jack cheese/ fajita onions/peppers, while their chicken sandwich's got jack / smoked bacon/ chipotle mayo, and is seasoned with their special "Austin marinade", presumably so named for the bulk of Steve's fans, who, like a marinade, mostly just sit around all day. Burritos: Holler at a grilled chicken joint stuffed with black beans and smothered in ranchera sauce, or grab a red beans/ ancho chile sauce'd number brimming with tender skirt steak, which, even if it wore a pant suit to work, would still get treated like a piece of meat. Wings: Available in normal and "Texas Sized" platters, these mesquite-grilled, ranch-accompanied suckers are dry-rubbed -- after finishing the Texas Sized one, you'll be lucky if you can get same. And should Texas-sized wings and steak burritos not fully do the job, they've also got supplemental snacks like red beans, chips and salsa, and a homemade almonds/Ibarra chocolate-filled "Austin Brownie", which would also make for a cunning disguise, as there's way less chance of you losing your fake sash.